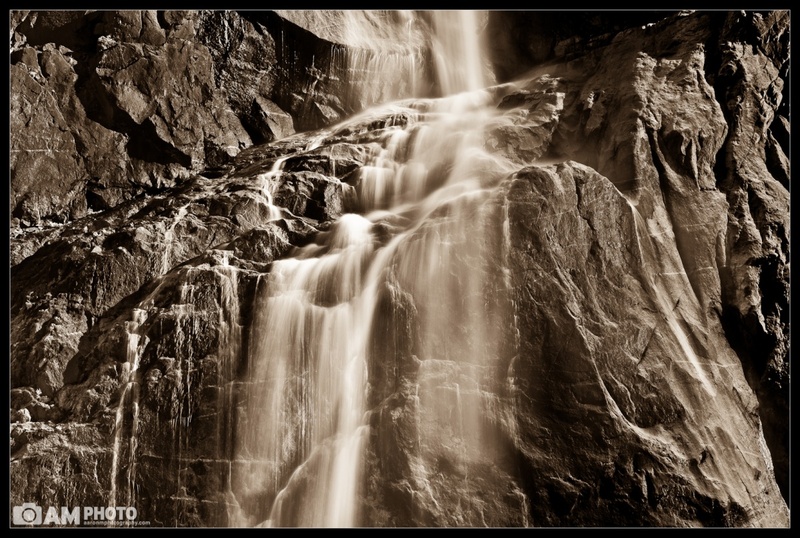 A couple years back I was in Yosemite when there wasnt much water and I was able to walk all the way into Bridalveil Falls, almost to the rock face behind the falls. Along the way I found an amazing little mini-falls that turned into one of my favorite photos. While preparing for this Yosemite trip I noticed that Yosemite falls still had water, although only a trickle. I figured that we might be able to get pretty close to Lower Yosemite Falls and it might also make for an interesting photo. Early Sunday morning we woke up and drove over to the lower falls. The water was just a trickle and we could walk along the rocks to get closer to Lower Yosemite Falls. Embarrassingly, along the rock-skipping journey I heard a giant Rrrrrrriiiiiiiipppp and looked down to see that my pants had split along my thigh Luckily they held together long enough to take my photos and get back to my campsite to change. Anyways, I digress. We were able to get surprisingly close to the rock face that hides behind Yosemite Falls and along the way I kept noticing that where Lower Yosemite Falls hits the rock and creates another falls was this gorgeous scene, which you see above. The further back I walked the better the scene got. BW F-Pro Circular Polarizer, Hitech 0.9 ND Soft, and 0.6 ND Soft.